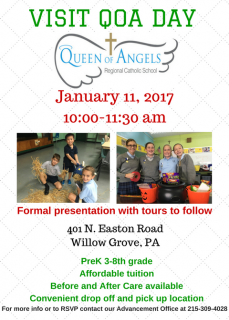 Queen of Angels Regional Catholic School will be hosting a Visit QOA Day Open House. A formal presentation about the school will take place with tours to follow. Come learn about all we have to offer for students in grades PreK 3 – 8. To RSVP or for more information, please contact the Advancement Office at 215-309-4028 or kodoherty@qoaschool.org.